Tektronix Inc., a leading worldwide provider of test, measurement and monitoring instrumentation, announced an expansion of its family of precision power analyzers with the introduction of the PA1000 single-phase power analyzer. Featuring a patent pending Spiral Shunt™ design, the PA1000 provides engineers designing and testing power supplies, consumer electronics and other electrical products with accurate power measurements in the shortest possible time. Tektronix Inc., a leading worldwide provider of test, measurement and monitoring instrumentation, introduced the MDO4000B series of mixed domain oscilloscopes that features significantly enhanced spectrum analyzer performance and, when used with Tektronix SignalVu-PC, the industry’s widest bandwidth vector signal analysis capability and deep support for WLAN 802.11 a/b/g/j/n/p/ac testing. Tektronix Inc., announced that it will enter the power analyzer instrument market and introduce a full new product line in the coming months. To facilitate this move, Tektronix has implemented a technology transfer agreement which includes power analyzer intellectual property, patents and product designs from its partner Voltech, which will exit the power analyzer segment of its business by September 30, 2013. Tektronix Inc. announced that lab testing has shown that its next generation performance oscilloscopes - due for availability in 2014 - will deliver real-time bandwidth of 70 GHz, with significant upside potential. The new oscilloscope platform will deliver the performance and signal fidelity needed for applications such as 400 Gbps and 1 Tbps optical communications and fourth generation serial data communications. Tektronix Inc. announced that it has expanded its revolutionary MDO4000 series of mixed domain oscilloscopes to include two new entry level models. 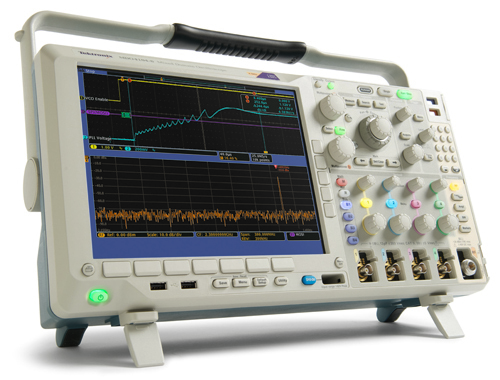 The new models provide breakthrough time and frequency domain analysis at a more affordable price level. Tektronix Component Solutions, a custom microelectronics services provider, announced an agreement with leading supply chain aggregator MOSIS to help customers develop complete, high-performance ASIC solutions while reducing the cost of early-stage ASIC development. Through the use of multi-project wafer runs for device prototyping and package development early in the design cycle, customers can costeffectively improve the time to first packaged ASIC.